Also be aware that yellow squares disappear from the map after 6 days. These are not maps of the area burned since the fire began, just maps of where heat has been detected during the past week. At 4:30 this afternoon, Cal Fire issued a press release stating that “firing operations may occur (in the Big Sur area) in the next 24-48 hours.” From the look of the heat detection map, those operations had already begun. 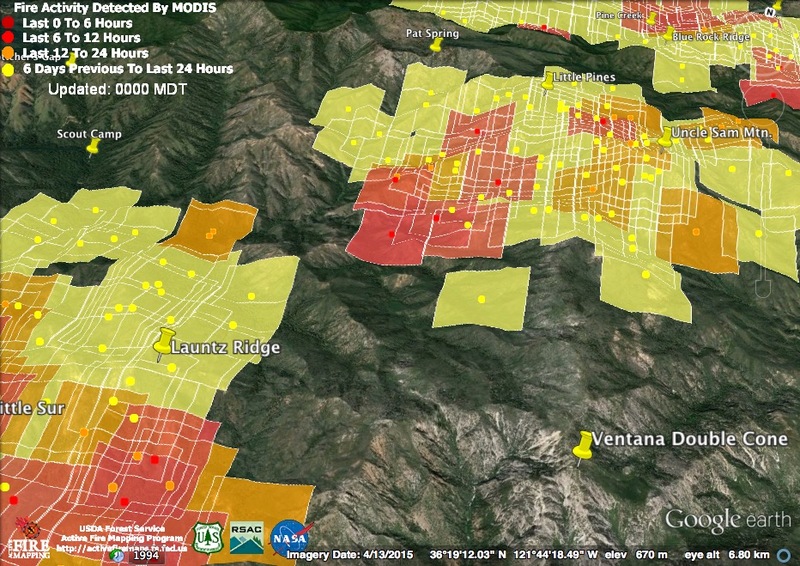 The map shows, as expected, renewed flare-ups at high elevations near the Ventana Double and, as ever, around Uncle Sam Mountain. But it also shows three heat detections from what is almost certainly a firing operation along the fire line at the north end of the Coast Ridge. 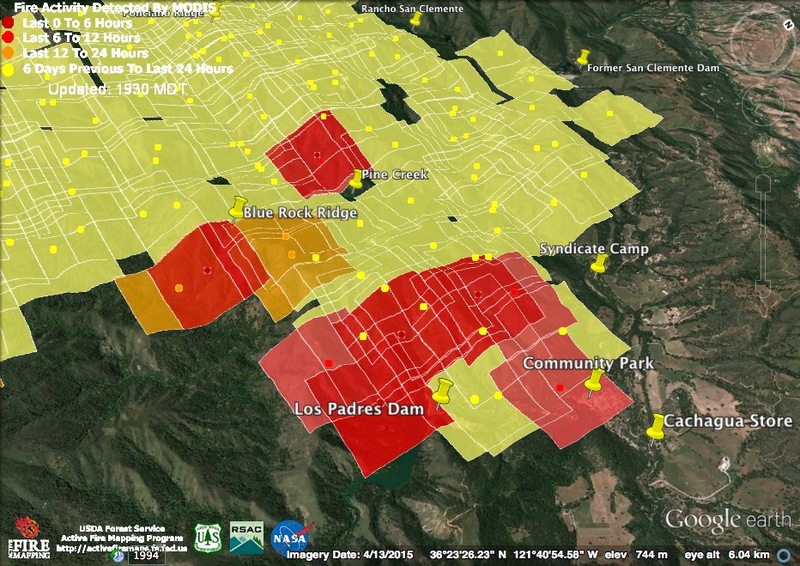 Here’s a close-up view of the new heat detections in relation to the fire line. Remember that the squares represent the margin of error. There is no evidence of any heat on the wrong side of the line. These detections were acquired around 12:30 pm, this afternoon. The purpose of this firing operation is obvious. It is to prevent the fire now backing into the Big Sur Gorge from crossing the river, making a hard uphill run, and breaching the Coast Ridge line. By backfiring from this line now, firefighters hope to prevent the fire from getting into the canyons above Nepenthe, the Henry Miller Library, and Deetjen’s. 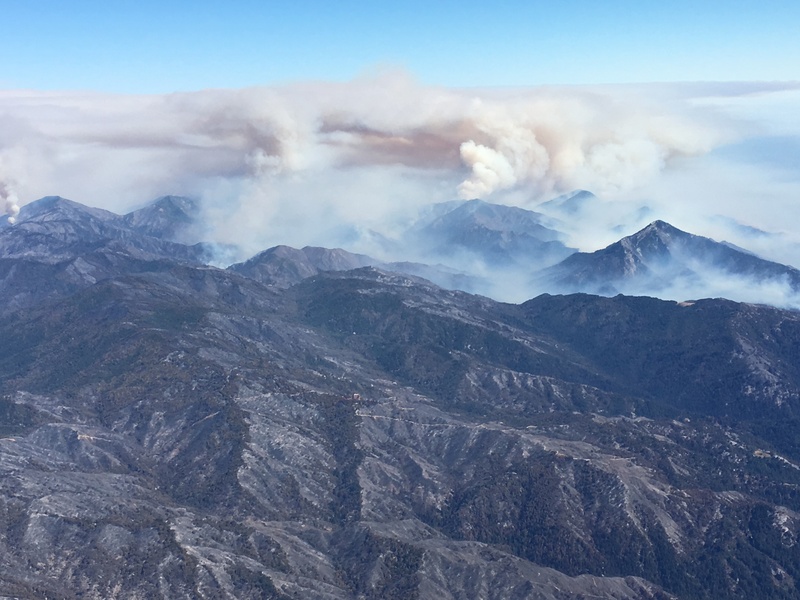 They will likely continue backfiring southward along this line (which runs along the top of the Coast Ridge) in an effort to keep the fire contained within the Ventana Wilderness and away from the inhabited coastal canyons. Back in the Big Sur Valley and at other low elevation locations, the marine layer continued to keep the fire in check during the day today. The marine layer continued to keep the fire suppressed at all but the the highest elevations overnight. A warming trend is expected to begin today and last at least through Saturday. The marine layer will be thinner than it’s been for the past few days, but it may still be able to keep things cool along the coast and, most importantly, in the Big Sur Valley. The exact behavior, and timing of arrival and departure, of fog banks is nearly impossible to predict. Unfortunately for the Monterey Peninsula, but fortunately for the South Coast, light south winds will continue to spread smoke northward. Air quality is very bad, maybe the worst it’s been since the fire began, in Carmel and around the mouth of Carmel Valley this morning. For the second day in a row, no infrared map has been released. There has been no word on why these maps have disappeared, but perhaps the fog has simply been too thick and wet to allow a meaningful scan. Since it usually takes more than 24 hours for other official maps to be updated to reflect the new perimeter shown on the morning infrared map, the fire perimeters shown on this morning’s official maps are now about three days, rather than the usual one day, out of date. 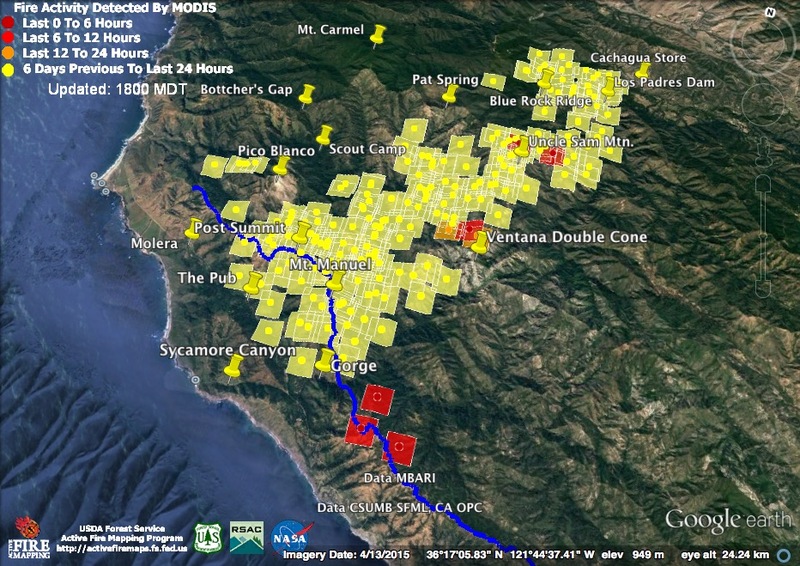 These heat detections, acquired at around 3:00 am, suggest that fire was actively converging on the Ventana Double Cone from the North Fork Little Sur and Carmel River watersheds. Since the last heat detections in this area, the fire appears to have burned the area of Lone Pine Camp, at the headwaters of Lone Pine Creek. This morning’s official numbers: 69,837 acres; 55% contained; 57 homes and 11 outbuildings burned; 3 homes and 2 outbuildings damaged; 1 fatality and 3 injuries. The heavy marine layer suppressed active burning all day today over most of the fire. Only at high elevation, near the Ventana Double Cone, did the 3:00 pm satellite find a couple of flare-ups. A fire near the Molera Fire Camp frightened many fire-weary residents of the Big Sur Valley today, but turned out to be a prescribed burn designed to eradicate Italian thistles. Would have been nice if they’d announced it in advance. 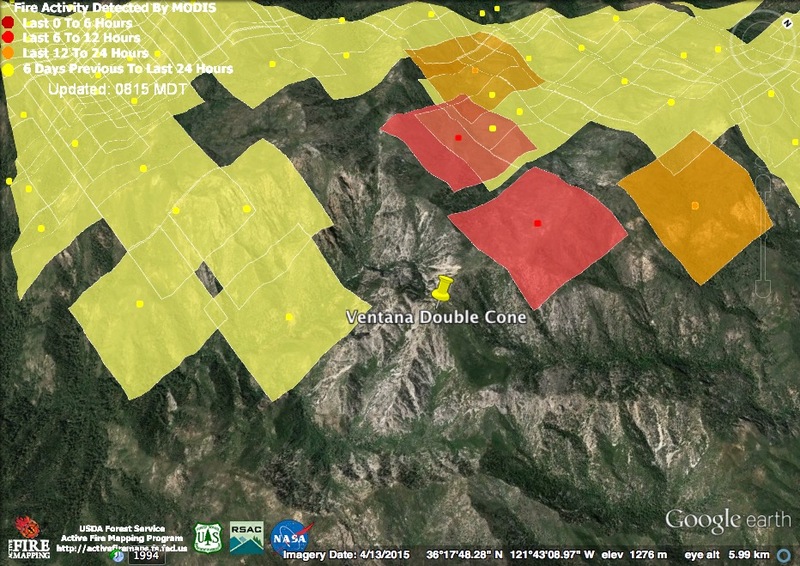 The heat detections found by the 3:00 pm satellite were high in the headwaters of the North Fork Little Sur and in the Carmel River watershed between the Puerto Suello saddle and Lone Pine. The fire remains north of the Big Sur River and west of the Carmel River. 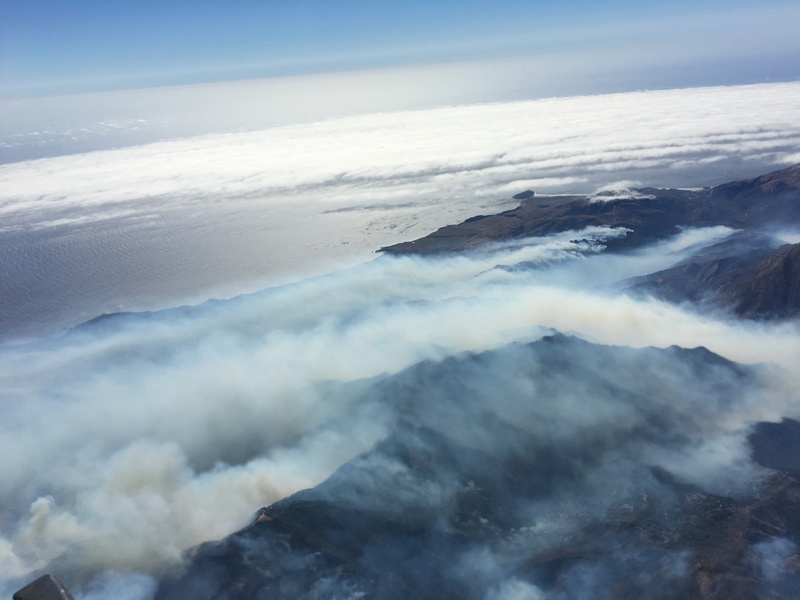 The marine layer is forecast to compress tonight, which may allow more burning at higher elevations, but is expected to keep the smoldering fire in the Big Sur Valley suppressed. This evening’s official numbers (unchanged since this morning): 68,698 acres; 50% contained; 57 homes and 11 outbuildings burned; 3 homes and 2 outbuildings damaged; 1 fatality and 3 injuries. Last night’s thick, drizzling marine layer spread so much moisture across the fire that, for the first time since the fire began, the satellites detected no heat overnight. It is impossible to overstate how extremely fortunate the arrival and persistence of this fog has been for the Big Sur Valley, where fire continues to creep and smolder over a wide area. The fog is expected to be slow to lift, so fire activity is forecast to remain minimal for most of the day. Tonight, on the other hand, the marine layer is expected to compress, allowing the fire to start becoming more active again, at least at higher elevations in the Ventana Wilderness. No infrared map has been made available yet this morning. This morning’s official numbers: 68,698 acres; 50% contained; 57 homes and 11 outbuildings burned; 3 homes and 2 outbuildings damaged; 1 fatality and 3 injuries. The MODIS servers are back on line. What they show is that the marine layer moderated fire activity in the Big Sur Valley in the early morning hours and through most of the day today. 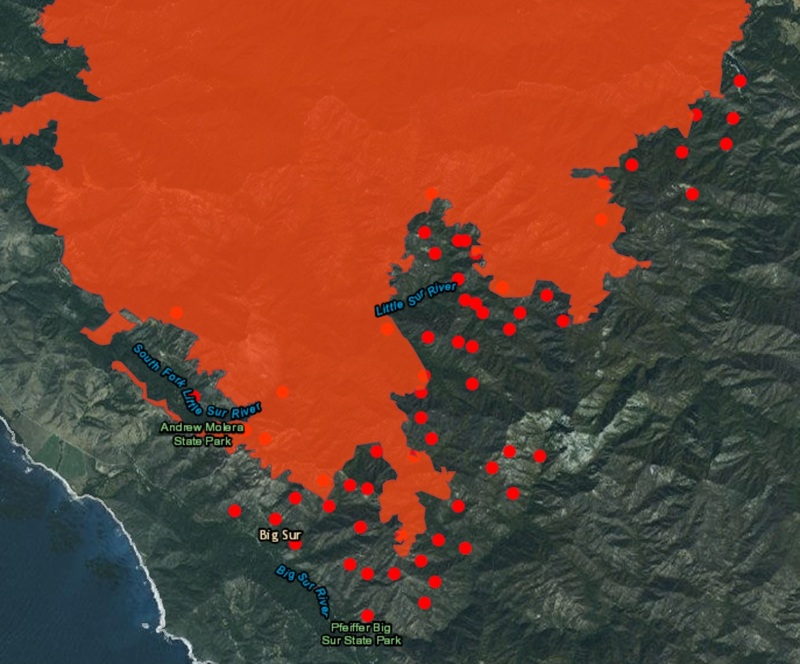 Make no mistake, though, fire is most definitely still burning in the Big Sur Valley and endangering homes there. Meanwhile, fire further east and at higher elevations continues to burn very actively. The red squares were acquired at around 12:30 pm and 2:00 pm this afternoon. The heat detections depicted by the orange squares were nearly all acquired at around 11:00 pm last night. The squares represent the margin of error. Fire was actively backing down the slope, but had not yet reached the floor of the Big Sur Valley. It is obviously very fortunate that fire did not continue burning at that intensity through the night and into the day today. This may have been the first morning ever in Big Sur where no one complained about the fog. Although fire has continued to smolder and back today, it was not intense enough to be picked up by the 12:30 pm and 2:00 pm satellites. 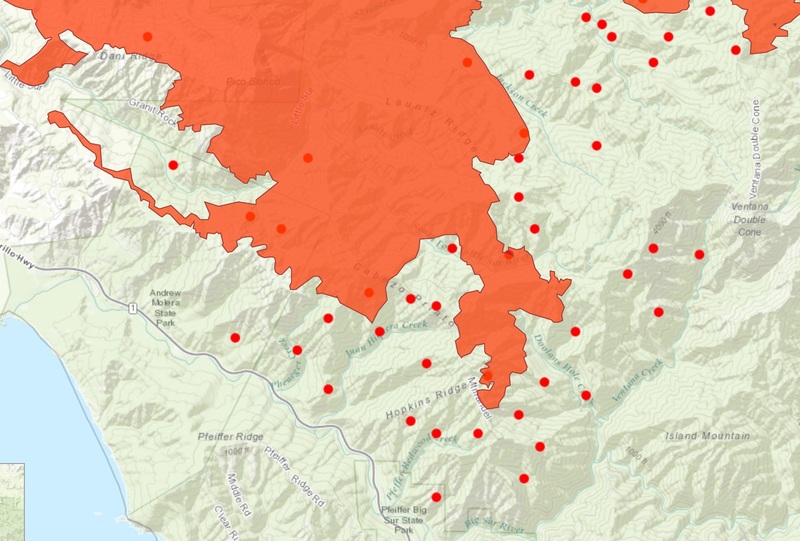 Since that time, fire activity in the Big Sur Valley has increased somewhat. Hopefully, the marine layer, which is forecast to be thicker and damper than last night, will return soon. Back in the Wilderness, the fire continues to spread in the same areas seen in yesterday’s photographs. 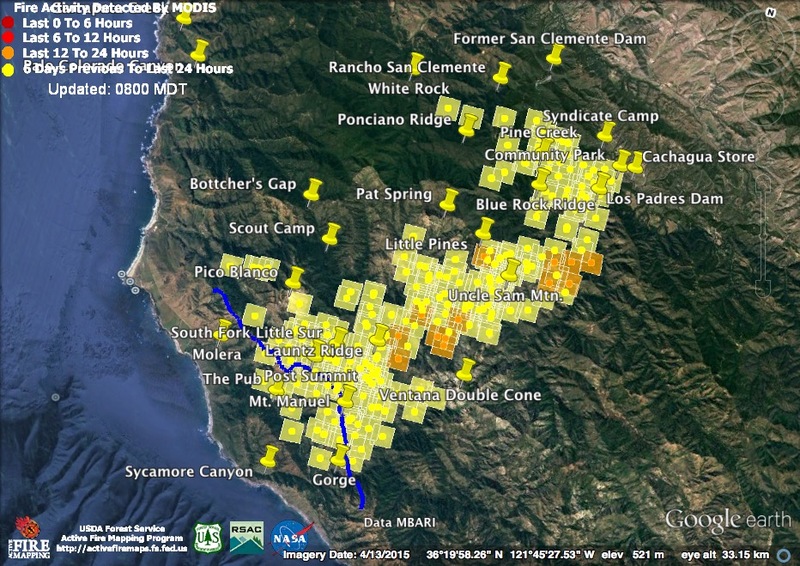 The biggest flare ups are in the upper North Fork Little Sur watershed and on the slopes of Elephant Mountain, overlooking the Carmel River just upstream of the Los Padres Dam. This evening’s official numbers (unchanged since this morning): 67,092 acres; 50% contained; 57 homes and 11 outbuildings burned; 3 homes and 2 outbuildings damaged; 1 fatality and 3 injuries. The MODIS servers are still down this morning, so we’ll be looking at the overnight data in some different formats. 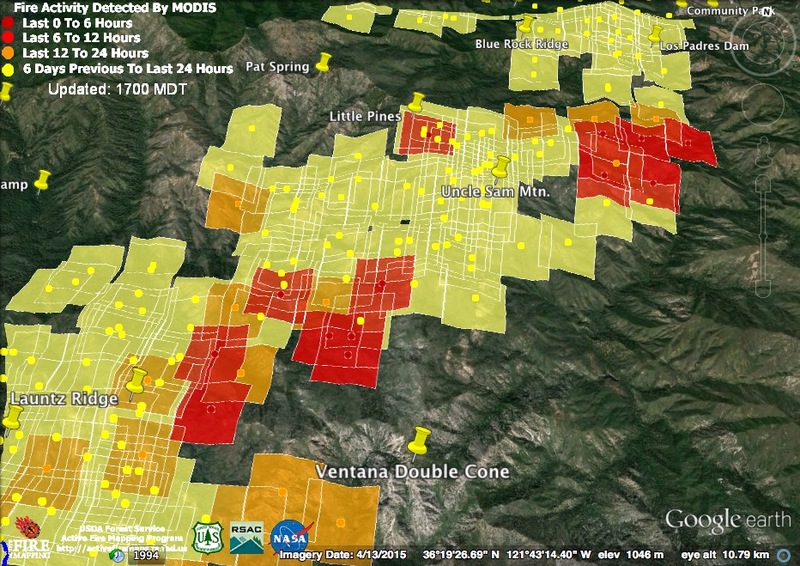 This map shows the previously mapped perimeter of the fire’s southern edge with the red dots representing heat detections over the past 24 hours. This format doesn’t show the margin of error around these detections, but be aware that it still exists. 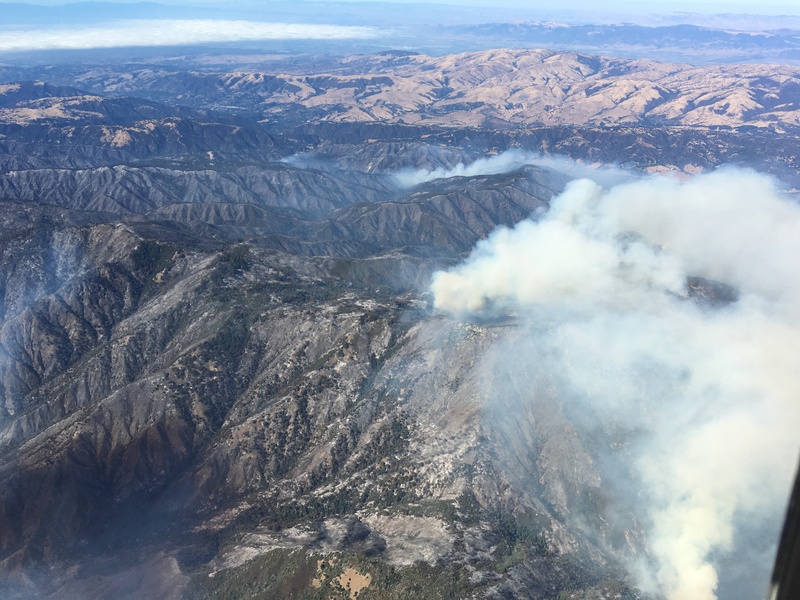 The map suggests, and photos posted to social media overnight confirm, that the fire is now well-established on the eastern slopes of the Big Sur Valley. It looks like this on last night’s infrared map. 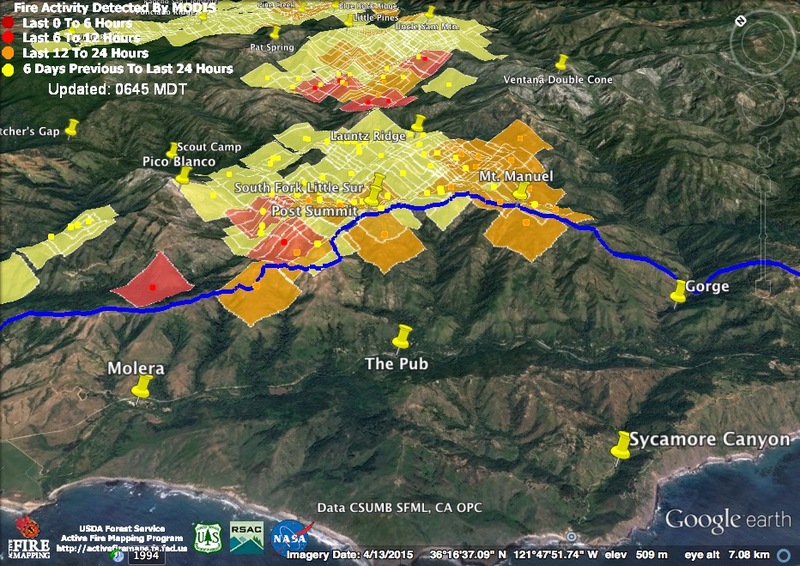 This data was acquired around midnight and the fire has backed further downslope into the Big Sur Valley since then. Click here for the full infrared map. Here’s a view of the fire’s advance using a topographic map format. 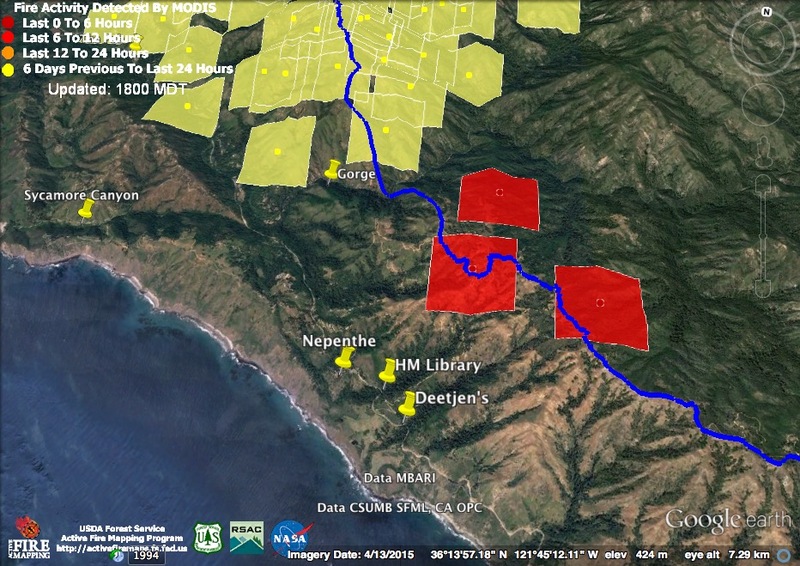 This map suggests that, at the time these heat detections were acquired, the fire remained north of the Big Sur River and west of Ventana Creek. As was evident from yesterday’s photos (see last update), there’s been expansion to the east as well, primarily in the form of large runs on the slopes of Elephant Mountain. The fire, for now anyway, remains west of the Carmel River. Today’s forecast calls for the marine layer to clear to the coast by 10:00 am in Big Sur, suggesting that things may get active again as the day wears on. A thicker marine layer and higher humidities are expected tonight. This morning’s official numbers: 67,092 acres; 50% contained; 57 homes and 11 outbuildings burned; 3 homes and 2 outbuildings damaged; 1 fatality and 3 injuries. The servers I normally visit to get MODIS heat detection data are down tonight. There are other ways to access that data, but I haven’t found one that provides it in the format I prefer. All is not lost, though, because I happen to have something even more up to date: photos from an overflight of the fire this afternoon between 4:00 and 5:00. A big thank you to Michael Troutman, and Chris Gularte of Specialized Helicopters, for taking me along. Approaching the fire from the north. Uncle Sam Mountain on the far left, Pico Blanco on the right. Green Ridge in the Center foreground. Wind was whipping up flames in many places, but the biggest column was rising from the back of Mt. Manuel and the headwaters of the South Fork Little Sur. 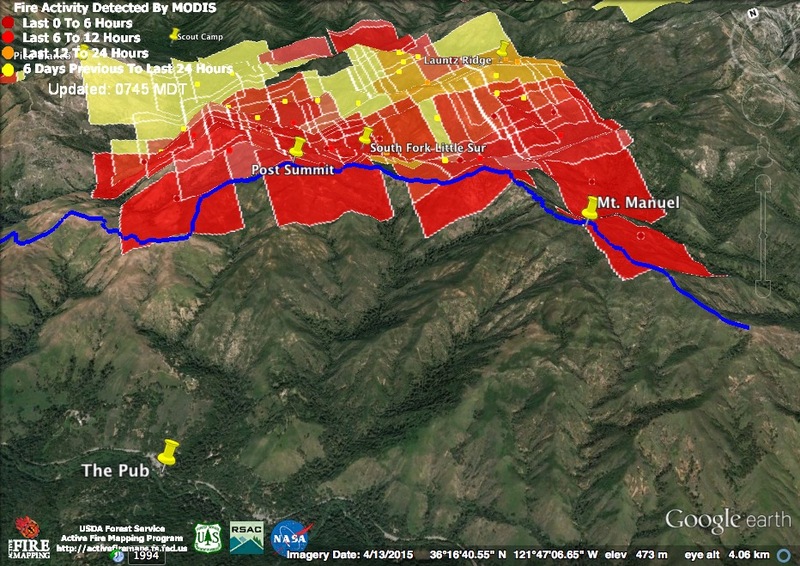 Green Ridge, Long Ridge, Skinner Ridge, Mescal Ridge… and the fire marches on. The Palo Colorado Rd. can be seen emerging from Palo Colorado Canyon in the lower center of the photo, then following the green stripe across Rocky Creek to cross Long Ridge at the Hoist, then continuing to follow the green stripe to Bottcher’s Gap. Pico Blanco veiled in smoke. Fire burning on both sides of Dani Ridge. Dozens, if not hundreds, of hot spots and flare ups stretch from one side of the Santa Lucia Mountains to the other in the background. Very difficult to see what was happening in the smoke-shrouded Big Sur Valley. Apple Pie Ridge can be made out in the upper left. The sweep of the Highway approaching the entrance to Pfeiffer Big Sur can be seen at the bottom, just left of the skid. The patch of unburned grass center-right is on Hopkins Ridge, and a bit of the Cabeza Prieto Ridge fire line can be seen in the upper right. 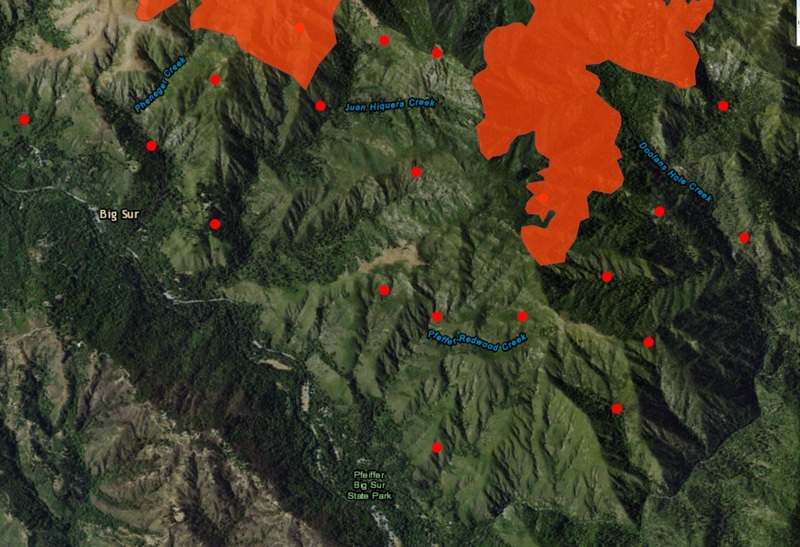 Fire is clearly burning on the west side of the line in the headwaters of Juan Higuera Creek, but does not appear to have made much progress down slope toward the Big Sur Valley. Looking back at the Mt. Manuel/Cabeza Prieto/Post Summit Ridge from the east. Smoke rising from the fire in the headwaters of Juan Higuera Creek can clearly be seen to the west of the ridge in the lower left. Burn out operations along the ridge to the west of the lower South Fork Little Sur can be seen in the far background. Moving back into the Wilderness, we take a look at the Puerto Suello Saddle. Looks like the fire has temporarily removed some of the brush that was plaguing hikers on the climb to Lone Pine Camp. 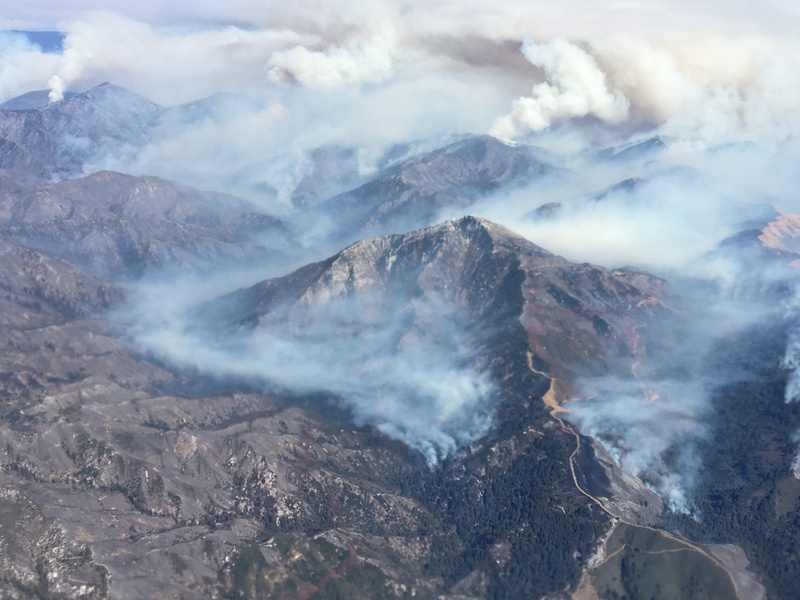 The ridge behind the saddle rises to Uncle Sam Mountain, where fire has been actively burning for something like a week now – and still isn’t finished. Little Pines can be seen on the ridge to the left. 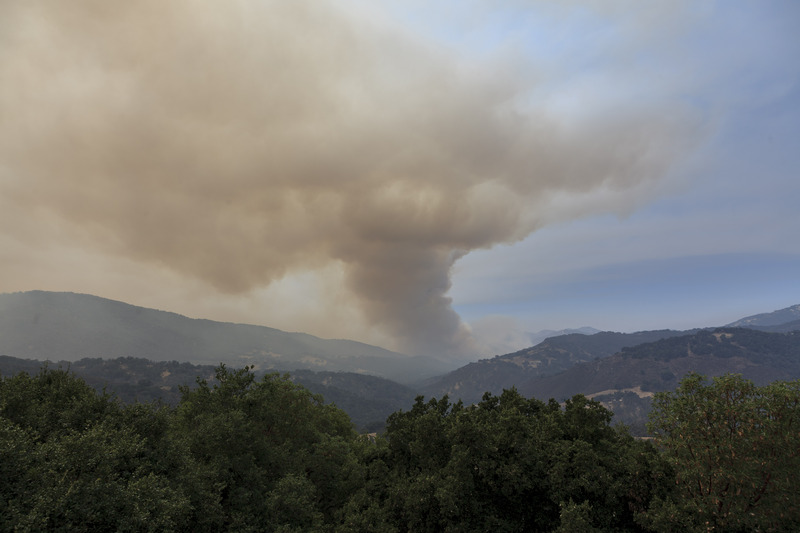 In the background, smoke can be seen rising from burn out operations near the confluence of Pine Creek and the Carmel River – just downstream from Syndicate Camp in Cachagua. The high plateau that serves as the headwaters of Danish Creek was once so heavily forested in large ponderosa pines that it was called Big Pines. Today, the former site of that old growth forest looks more like Big Desert. Some remnants of the forest remain green, for now anyway, near Pat Spring. The annihilation of this once magnificent forest through too frequent burning is a real tragedy. Not a good day for climbing the Ventana Double Cone. On the left, Danish Creek descends from the crater that was once Big Pines. To its right is Blue Rock Ridge, followed by Pine Creek and Ponciano Ridge. 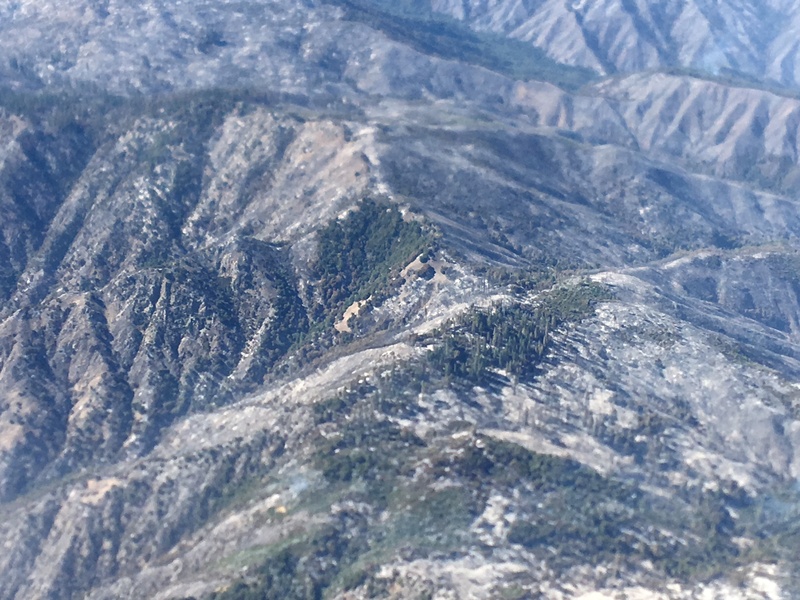 Notice how the brushy southern sides of the ridges are burned off completely, while ground fire has left the more heavily forested northern slopes still looking green. The south side of Blue Rock Ridge has burned repeatedly in recent years, while the north side probably hasn’t burned in more than 70 years. Vegetation type, wind, humidity and other factors are much more important to determining how hot a fire will burn in the Santa Lucia Mountains than the length of time since the last burn. Over Cachagua, looking back. Smoke in lower left is from fire in lower Danish Creek. Small smoke columns up and to the right of that are rising from Rattlesnake Creek. Large dome of emerging column in the background is rising from somewhere around the divide between the South Fork Little Sur and Ventana Creek. The smaller column in front of Pico Blanco is rising from fire in the North Fork Little Sur/Comings Creek area. Our hope for tonight is that humidity recovery will be better than expected and that the winds will die down. It will be a sleepless night for many in Big Sur. This evening’s official numbers: 60,900 acres; 50% contained; 57 homes and 11 outbuildings burned; 3 homes and 2 outbuildings damaged; 1 fatality and 3 injuries. Good news. The fire appears to have been less active than anticipated last night. The red squares indicate heat detected around midnight last night. Yesterday was, in a word, bizarre. The strangeness actually began Saturday evening. Flames were visible on the ridge behind the Big Sur Valley, but there was no information forthcoming from fire officials about what was going on up there. Someone who had been to meetings at Incident Command reported that burn out operations were taking place, but firefighters coming off the line reported that burn out operations had not yet begun and that the main fire front was challenging the line. 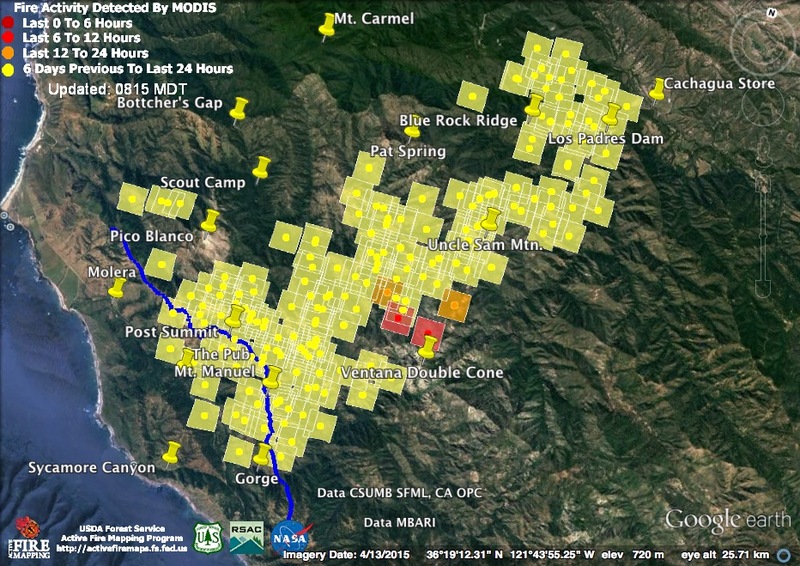 Then, without warning (the Big Sur Valley had not been under even an evacuation warning), at 3:00 am Sunday morning, a mandatory evacuation was ordered for the entire Big Sur Valley, both sides of Highway One, from Molera to Deetjen’s. Neither Cal Fire nor the Sheriff issued any information whatsoever about why they were rousting hundreds of people from their beds. It was mid-morning before even a copy of the evacuation order itself appeared on line. People packed their things and, realizing, due to the strange rules that govern evacuations in these parts, that they would probably be prevented from returning home for many days if they left, made difficult decisions about whether or not to obey the order. Decisions that would have been greatly aided by even the slightest scrap of official information about what was going on. Many left. Campgrounds and lodgings sped their guests on their way. Business owners called their employees and told them not to come in for work. 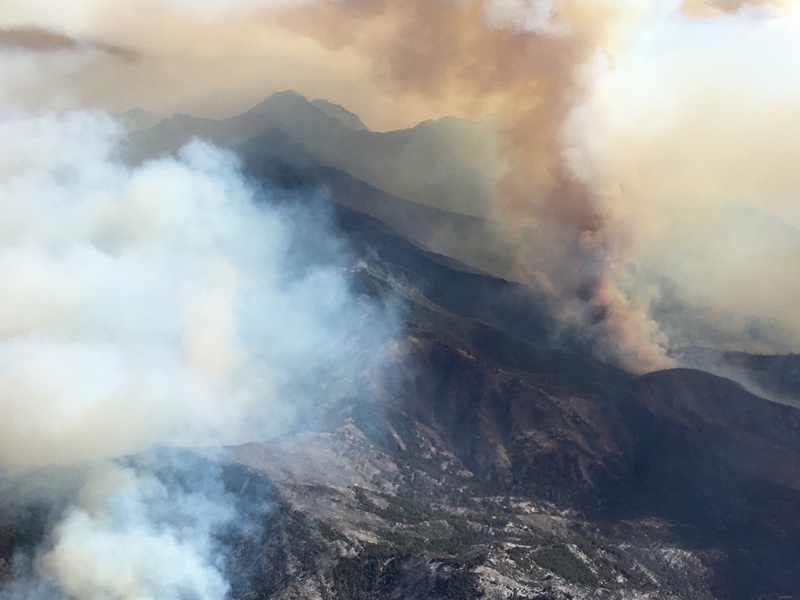 The evacuees could see flames on the wrong side of the line near the top of Post Summit and in the headwaters of Juan Higuera Creek and assumed, although there was still no official word, that the evacuation had been called because the fire had escaped control there. Yet, to the surprise of nearly everyone, the Highway and other roads in the evacuation zone remained completely open. The sun came up and tourists arrived as normal. Soon tourists were milling around the closed businesses knocking on doors, drinking the coffee that had been left out for firefighters, and trying to find someone to sell them breakfast. Visitors were also, as normal, driving up and down Sycamore Canyon to visit Pfeiffer Beach. Neither the Sheriff nor CHP provided any information about why the roads had been left open throughout an area under a mandatory evacuation order, and most residents who remained, believing it was an oversight that would be quickly remedied, planned accordingly. As residents who had evacuated to town in the dead of night got word that tourists were now ambling around in their evacuated neighborhoods, they got upset. Some of them returned. At 9:30 am, a post appeared on line providing information from someone who had managed to speak to a Cal Fire Public Information Officer. They reported that fire was burning about 100 acres over the line, but that burn out operations were underway and everything was going well. This second-hand account was the best information available. Not even the briefest Tweet about the situation was forthcoming from Cal Fire PIOs or other officials. Cal Fire’s morning update, which arrived unusually late, listed the new evacuations in the list of evacuated areas, but offered not a word about why such major new evacuations had been ordered. There continued to be no word from the Sheriff or CHP on why the evacuation appeared to apply only to residents and not to tourists. Then, as the morning wore on, a CHP unit suddenly appeared at the head of Sycamore Canyon and established a hard closure. Not only visitors, but residents as well, were prevented from entering. Word began to filter out from those with friends in high places that the Sheriff intended to keep the Highway open, so as not to harm local businesses (nearly all of which were closed), but that public and private roads off the Highway were under the usual hard closure orders that accompany mandatory evacuations. This meant that, while tourists continued to be free to mill about in front of the River Inn, directly below the fire, residents of Sycamore Canyon, with Pfeiffer Ridge still between their homes and the fire, could not return home even to retrieve family photos or important papers. Realizing that the evacuation was not what they had assumed, some businesses began to reopen. That special combination of absurdity and authoritarian officiousness that defines the term Kafkaesque had, in other words, been fully achieved. Finally, at 3:00 pm, a long expected official announcement was released stating that the mandatory evacuation west of Highway One was being reduced to an evacuation warning. There was still no official word on what was happening with the fire and, so far as I know, there has still been nothing said about it. The best news available this morning is that there were no heat detections overnight from fire on the wrong side of the control line (in blue) above the Big Sur Valley. That doesn’t, of course, mean there was no fire on the wrong side of the line – there was. Many people reported flames last night on the west side of the ridge between Post Summit and Mt. 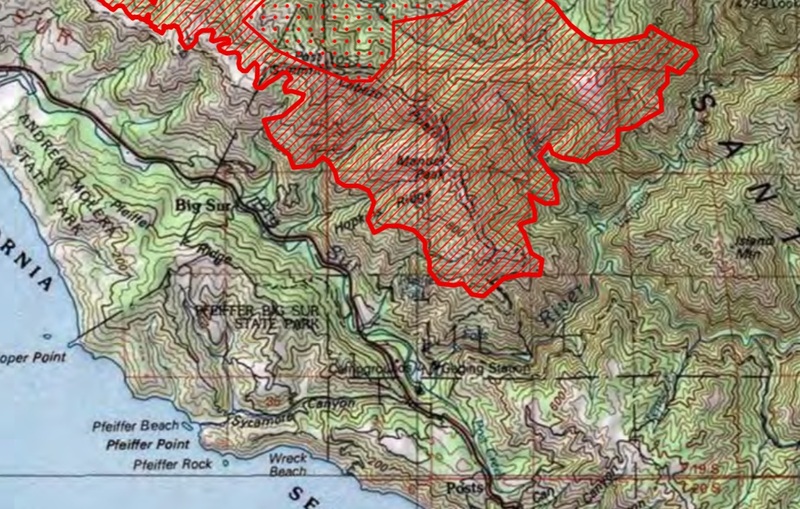 Manuel and others, as noted in the last update, saw fire burning well to the right of the heat detections on this map, on the slopes above the Big Sur Gorge. It does suggest, though, that the fire was much less active during the night. Last night’s infrared map, also based on data from around midnight, shows that burn out operations are clearly underway on East Molera Ridge (the heat detection on the left). Unlike the above map, it does find intense heat over the line near Post Summit and possibly over the line near Mt. Manuel. 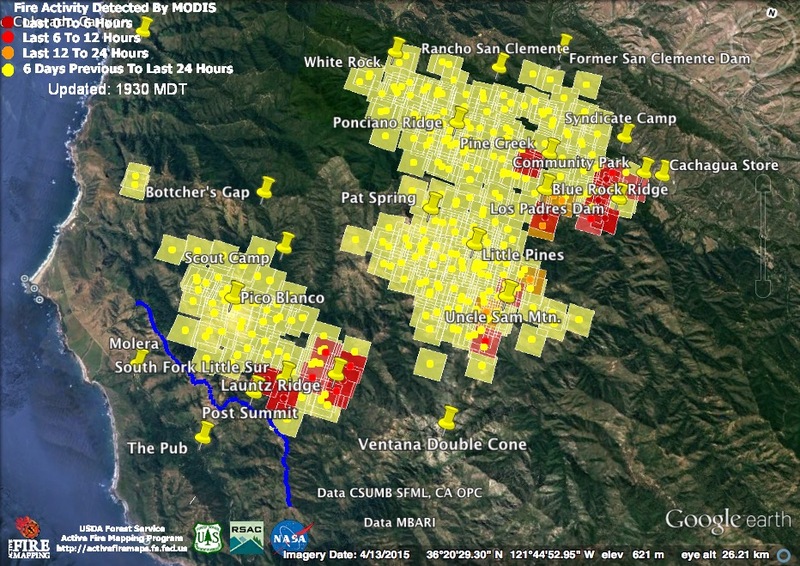 The only other fire active enough at midnight to be noticed by the satellite was in the upper basin of the North Fork Little Sur – one of the most remote locations in the Ventana Wilderness. This morning’s official numbers: 60,400 acres; 45% contained; 57 homes and 11 outbuildings burned; 3 homes and 2 outbuildings damaged; 1 fatality and 3 injuries. The red squares on this map are heat detections from satellite passes at around 11:00 am this morning and 2:30 pm this afternoon. 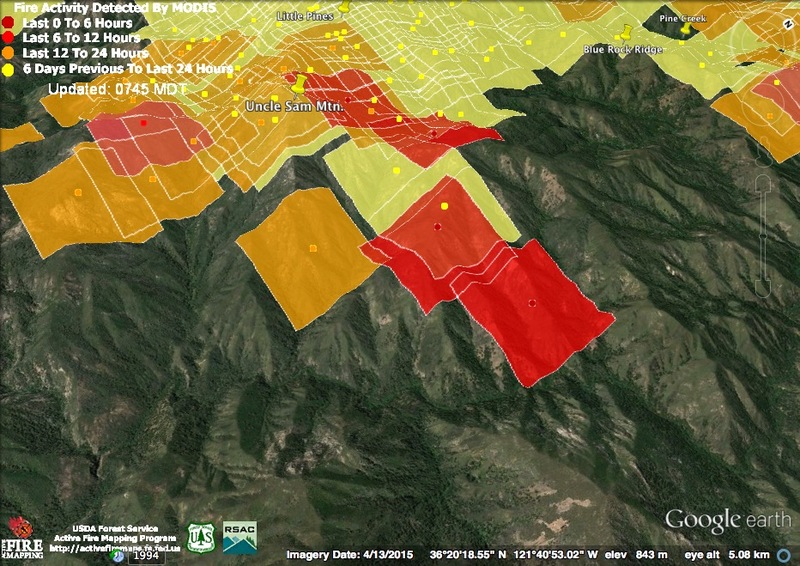 Compare to the map in the 2:15 Update (below) to see how the fire grew more active between those passes. As you can see, the 2:30 pm satellite did find three heat detections that might indicate fire over the line. The one on the left is in the area of East Molera Ridge. The one in the middle is in the area where the slop over was confirmed, near Post Summit. The last is by Mt. Manuel. All we can say for sure, is that fire was burning very actively along a wide swath of this critical fire line. Around 10:00 pm this evening there were reports of fire burning on the slopes of Mt. Manuel above the Big Sur Gorge. In the dark, the observers could not tell what side of the line this fire was on. This suggests that either burn out operations are being launched from the line in the gorge, or that the fire near the top of Mt. Manuel has made significant progress toward the gorge on its own. In any event, there was an awful lot of active fire just over the ridge from the Big Sur Valley today and, with tonight expected to be drier than last night, that activity may not die down soon. I have still seen no official statement from anyone regarding the reasons for the evacuation in Big Sur, acknowledging the slop over near Post Summit, giving any progress report on containing it, or offering any information on how the effort to keep the fire out of the Big Sur Valley is going. Everything the public knows about this situation has come from eye witness accounts, information gleaned from personal encounters with fire fighters returning from the line, reports from people who have attended high level meetings and examination of satellite data. Thanks to social media, these tidbits of possibly reliable data can pieced together into what is probably a close-to-accurate picture of what is occurring, but I do not understand why the professionals, whose job it is to keep the public informed, have still had nothing whatsoever to say about a sudden, 3:00 am mass evacuation of hundreds of people. Fire was also active today in the very remote upper watershed of the North Fork Little Sur River. 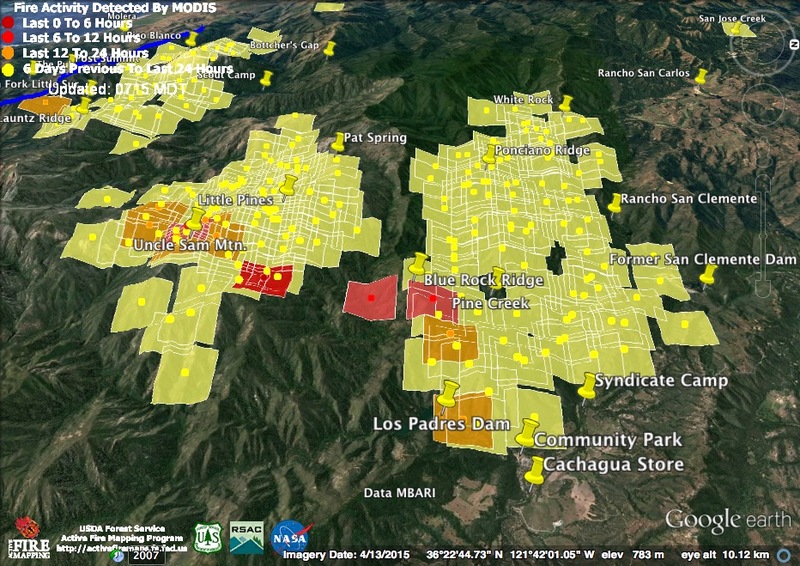 There was plenty of heat near Cachagua today, as well, although none that appears to indicate a renewed threat to inhabited areas. 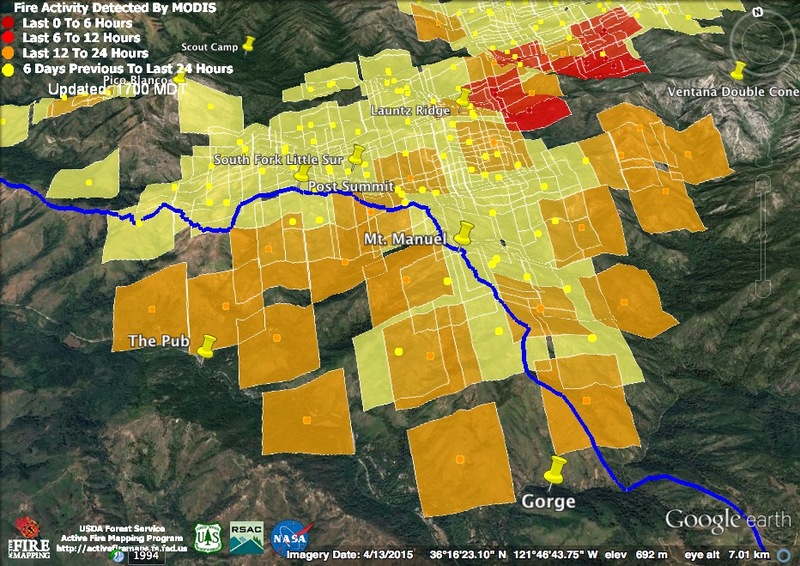 The heat detection in the foreground suggests a flare up near the confluence of Danish and Rattlesnake Creeks. This evening’s official numbers: 57,800 acres; 45% contained; 57 homes and 11 outbuildings burned; 3 homes and 2 outbuildings damaged; 1 fatality and 3 injuries. The mandatory evacuation for areas west of Highway One has been downgraded to an evacuation warning as of 3:00 pm. If there was never enough risk to put even a soft closure on the Highway, then the areas across the Highway from the fire should probably never have been put under a mandatory evacuation in the first place. It was absurd that the CHP was preventing residents from returning to their homes in Sycamore Canyon (which still has a ridge between it and the fire) earlier today, while tourists were free to wander aimlessly around the closed River Inn, directly below where the fire was burning. 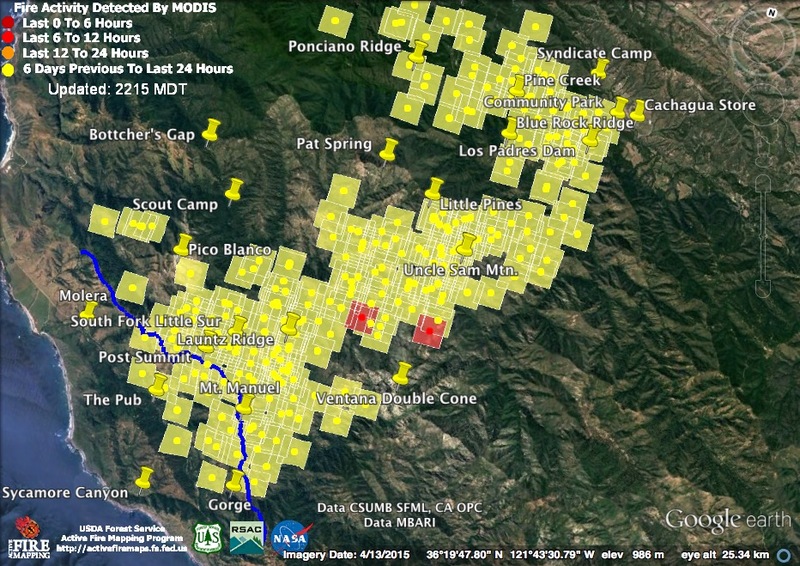 The latest satellite pass, at 11:00 am this morning, found no active fire near or over the Post Summit/Mt. Manuel line – a strong indication that firefighters are doing a good job of suppressing the slop over near Post Summit. 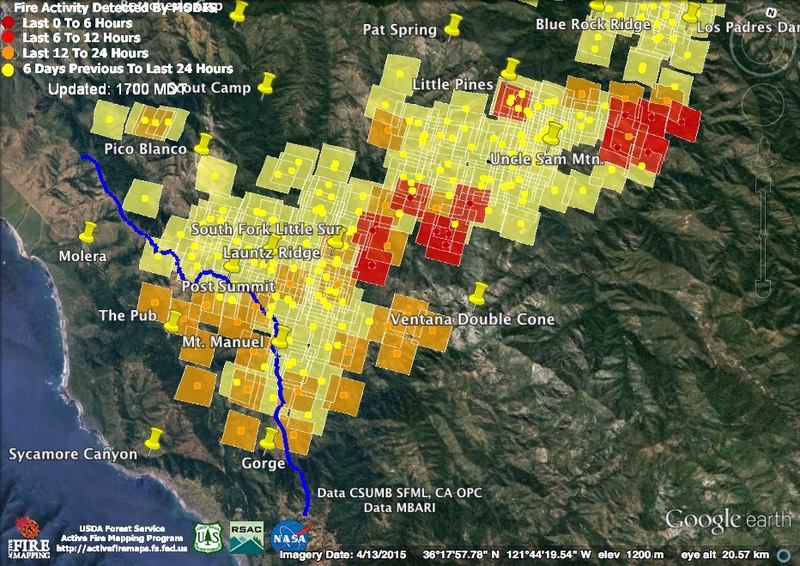 The Satellite did find significant heat on the back side of Post Summit and what looks like a major run out of the Little Sur and into the Big Sur River watershed above Ventana Creek. Firefighters are working hard to prevent the fire from backing into the Big Sur Valley and their chances of success appear good. Imagine how much confusion and anxiety that would have prevented – even if the message were less optimistic. There has still been no official comment on the reasons for the evacuation or any update on the progress of firefighting efforts. There has still been no announcement of any closure of Highway One and the Big Sur Blog reports that the road remains open. I can’t recall another “mandatory evacuation” where roads through the evacuation zone weren’t subject to hard closure or any other case where tourists were free to drive through evacuated neighborhoods. If they’re not concerned enough to close the Highway, my guess is that at least some of the areas ordered evacuated last night may soon have their evacuation orders lifted. At least I hope so. The prediction that it would be too damp to support active fire after midnight did not, unfortunately, come to pass. 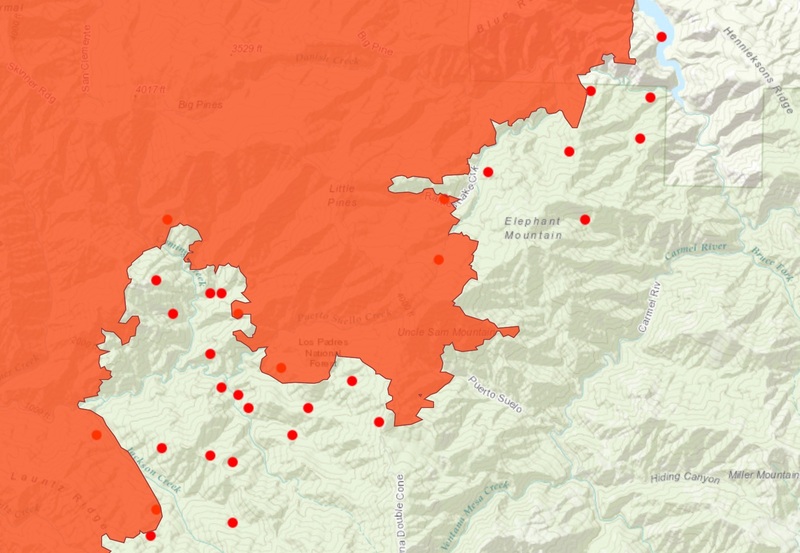 Light red squares were detected around 11:00 pm; dark red squares around 3:00 am (which is, perhaps not coincidentally, about the same time a mandatory evacuation order was issued for the entire Big Sur Valley). The 3:00 am satellite pass found a lot of heat along the Post Summit/Mt. Manuel line but, as the squares represent the margin of error, none of these detections definitively place fire over the line. 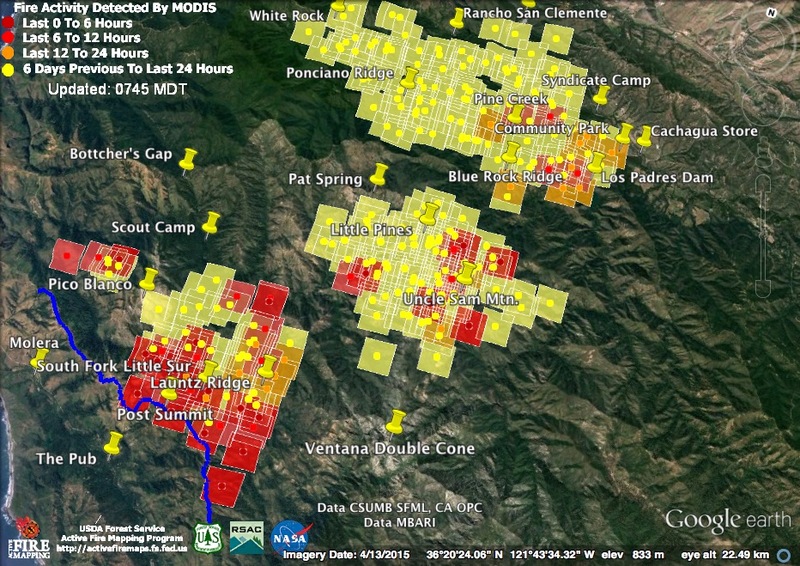 Beginning at around 1:00 am this morning, however, people in the Big Sur Valley began reporting to me that fire appeared to be over the line and this morning’s infrared map shows a small slop over near Post Summit. The infrared map was prepared around 4:00 am this morning, but the data was apparently acquired around 9:30 pm last night. The other indication that something is amiss was the sudden mandatory evacuation order for the entire Big Sur Valley (both sides of Highway One) issued around 3:00 am this morning (the Big Sur Valley had not previously been under even an evacuation warning). 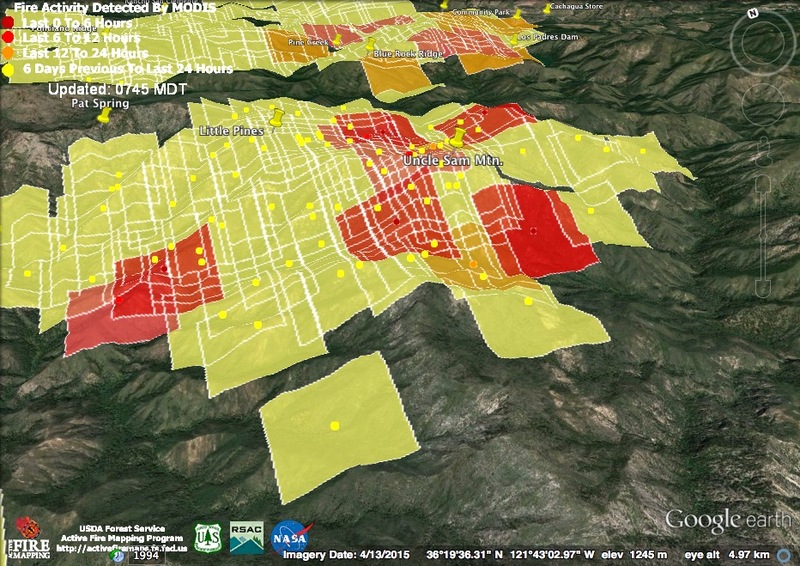 Eye-witness accounts now place fire high in the Juan Higuera Creek watershed (which could be the advance of the Post Summit slop over) and over the line near Mt. Manuel (which could be an additional slop over). While the consistency of heat along this line suggests that burning operations may have been taking place, there is still disagreement among “reliable sources” about whether firing on this line ever actually began. What is certain is that, as of right now, this appears to be an almost exact repeat of the events of July 2, 2008. The bottom line is this: While there is clearly fire over the line, at least in the vicinity of Post Summit, it is quite possible that firefighters may be able to knock it down from the air or contain it on the ground before it backs down into inhabited areas (in a repeat of 2008). The 2008 fire was aided by drier conditions and an offshore breeze. The sense of deja vu we’re all experiencing this morning is, obviously, strong, but things could still turn out better this time. 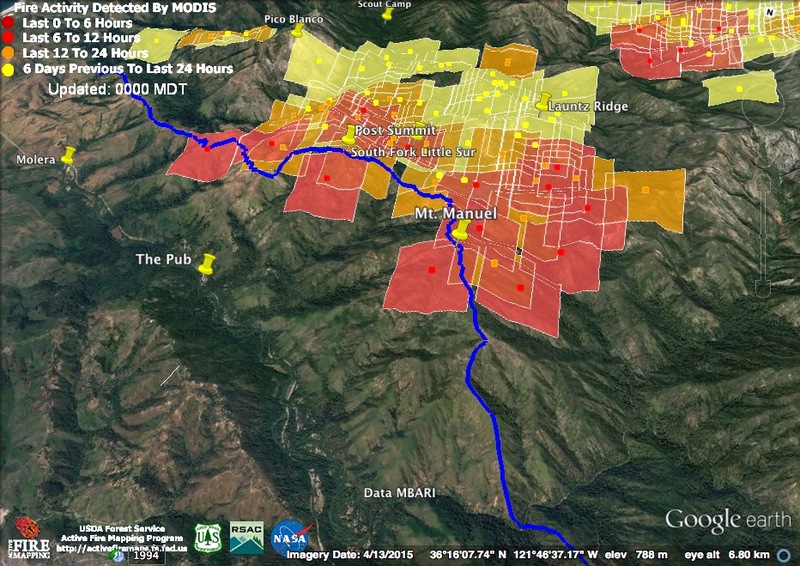 Both the above heat detections, and the infrared map suggest the fire also made a run out of the Little Sur watershed and entered the Big Sur River watershed in the headwaters of Doolan’s Hole Creek, behind Mt. Manuel. The fire on Uncle Sam Mountain continued active burning, of course, but also appears to be actively expanding again, both on the Little Sur and Carmel River sides. 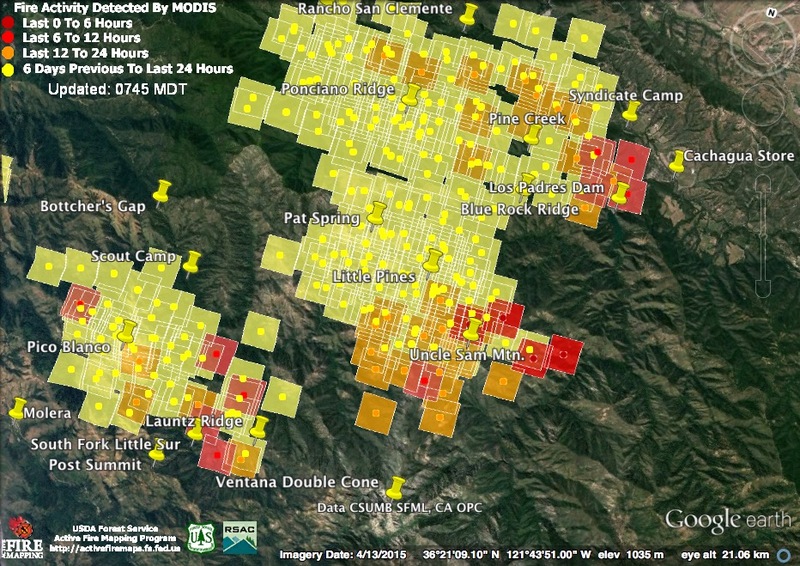 The 11:00 pm satellite found active burning taking place on Blue Rock Ridge and along Pine Creek, but that had died down by the time the 3:00 am satellite arrived. This morning’s official numbers: 57,500 acres; 45% contained; 57 homes and 11 outbuildings burned; 3 homes and 2 outbuildings damaged; 1 fatality and 3 injuries. The fire was more active today than last night. The satellite passes took place at around noon and 1:30 pm. Since the second pass was earlier than usual, this map doesn’t tell us much about what went on during the prime burning hours later in the afternoon. Fortunately, humidity is forecast to spike again tonight. In fact, the Fire Behavior Forecast, predicts that active flame will pretty much disappear between midnight tonight and whenever the marine layer begins to lift tomorrow. 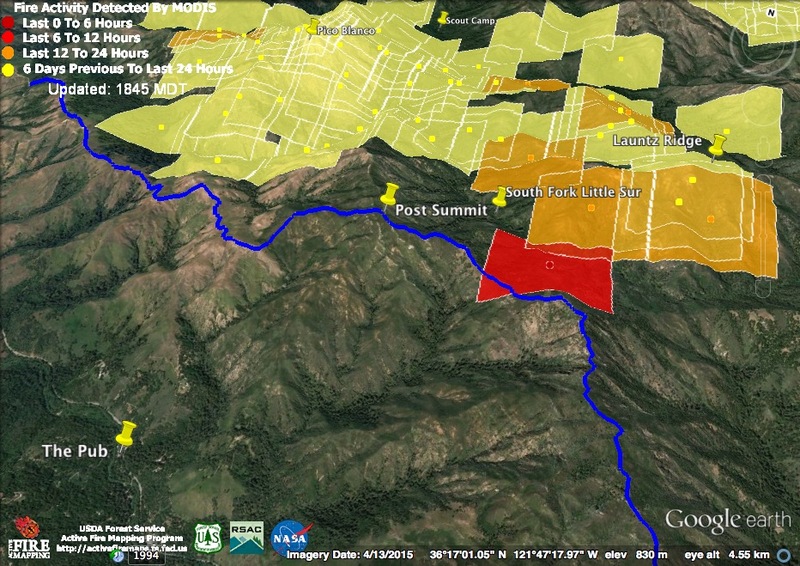 The fire along the South Fork of the Little Sur got active again today and, by mid-afternoon, it had apparently reached, but not crossed, the fire line (drawn in blue) near Post Summit. Burn out operations from this line have, apparently, still not begun, so it is fortunate indeed that this happened during poor enough burning conditions that the line could be held. The potential for additional, and quite possibly hotter, runs at this line obviously exists, so let us hope that tonight’s humidity does, in fact, suppress active burning and that firefighters will be able to begin burn out operations here soon. As this morning’s Fire Behavior Forecast stated once again; “Should the fire cross (the South Fork Little Sur) expect very high to extreme fire behavior and intensities with rapid rates of spread.” Well, it has crossed, so we can only hope that the humidity prevents that prediction from becoming a reality. Meanwhile, the satellites found an active fire front stretching from Jackson Creek, across Launtz Ridge to the headwaters of the South Fork Little Sur. 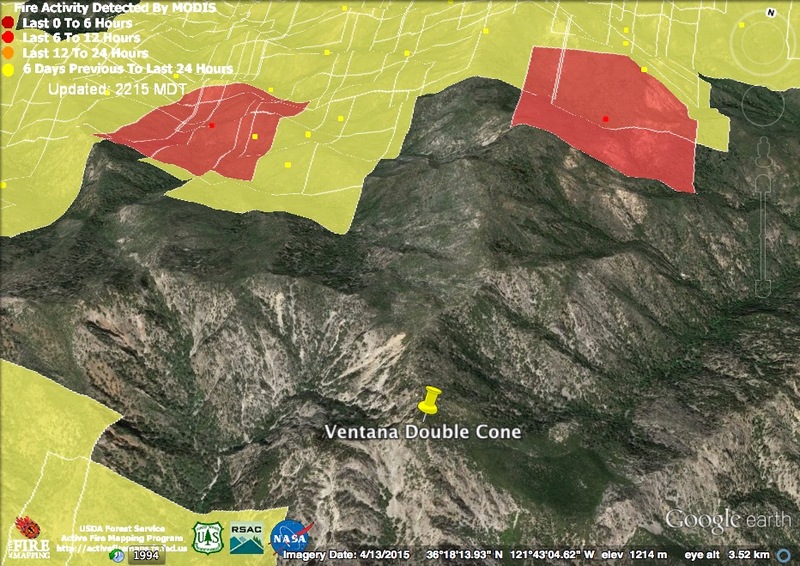 This front will probably continue to slowly move east toward Kandlbinder Peak and the Ventana Double Cone. I didn’t include a close up of the new heat detections around Uncle Sam Mountain because, let’s face it, we’ve seen it enough already. Suffice it to say that the country around Uncle Sam has demonstrated an ability to sustain active fire for a remarkably long period of time. The large patch of active fire stretching from the Los Padres Reservoir over the end of Blue Rock Ridge and down into the vicinity of the Cachagua Community Park and Prince’s Camp was the result of continued burn out operations designed to ensure that nothing remains on the hot side of the line that could reignite and lead to a slop over. All reports continue to pronounce it a success. The heat detection further up Blue Rock Ridge appears to be a continuation of the flare up that began in that location last night. The satellite also appears to have caught an island of unburned forest in Pine Creek finally burning off. This evening’s official numbers: They’ve finally been updated! 56,500 acres; 45% contained; 57 homes and 11 outbuildings burned; 3 homes and 2 outbuildings damaged; 1 fatality and 3 injuries. As predicted, high humidity made this the fire’s least active night so far. The 10:30 pm satellite pass recorded only three heat detections, the 2:30 am pass only one. The best news is that there were no additional heat detections at the bottom of the slope leading to the Post Summit/Mt. Manuel control line. The heat detected there at 2:30 pm yesterday was concerning because fire in that area could easily make a hard uphill run at the line. I wrote last night that I hoped that detection was the start of a firing operation from that line, but later reports were that the line was still being worked on and would not be ready to fire until today. Let’s hope the humidity keeps the fire along the South Fork Little Sur suppressed long enough for the firing operations to take place. The 10:30 pm satellite found heat, as usual, near the summit of Uncle Sam Mountain, in Danish Creek, and on Blue Rock Ridge (well back from Cachagua, for a change). 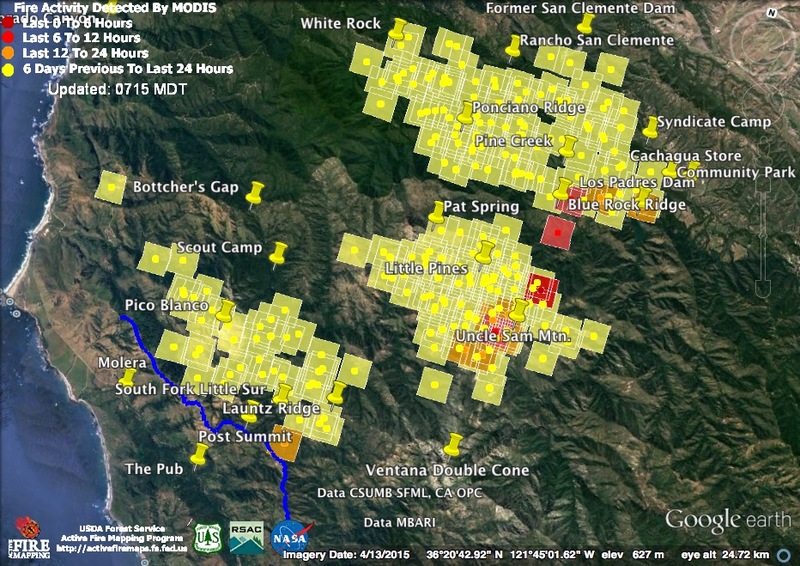 The position of these detections suggests that fire backing into Danish Creek from Blue Rock Ridge may have been making a reverse run back toward the ridge at the time the satellite passed over. The 2:30 am satellite found renewed heat nearby, in the Rattlesnake Creek watershed. 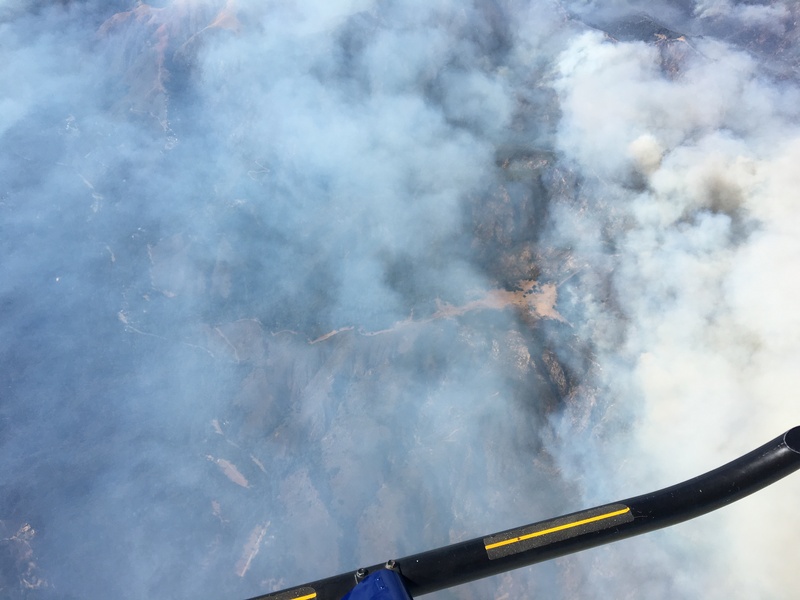 The fire along Rattlesnake and Danish Creeks will likely continue to creep down those watersheds toward the back end of the Los Padres reservoir. This morning’s official numbers: 55,600 acres; 40% contained; 57 homes and 11 outbuildings burned; 3 homes and 2 outbuildings damaged. As expected, cooler temperatures and higher humidity limited fire activity today. A satellite pass at around 11:30 am found heat only around Uncle Sam Mountain. A later pass, at around 2:30 also found heat near, if not across, the upper South Fork of the Little Sur River. 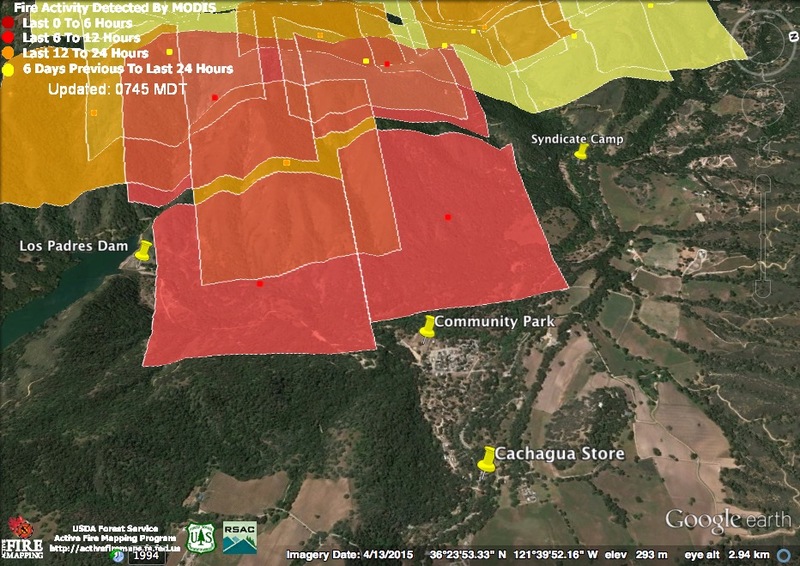 Elsewhere, including Cachagua, the fire was not hot enough to be noticed by the satellites. The burn out operations between White Rock and Cachagua appear to have been a success. With another day of cool temperatures and high humidity expected, the fire behind those lines may soon be declared contained. 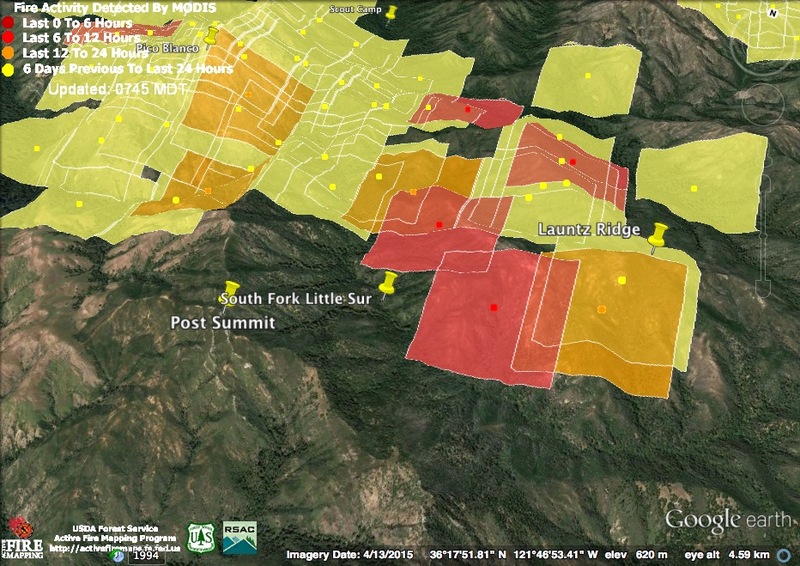 Does this heat detection represent the beginning of a burn out operation along the Post Summit/Mt. Manuel line? Firing operations weren’t listed as an assignment for this Division this morning and reports during the day suggested that firing would begin here Saturday, or Sunday at the latest. The proximity of the approaching fire front could certainly have caused them to start earlier than planned. Or… it could be a flare up of the main fire. Since the red square represents the expected margin of error, this heat detection could still have come from the north side of the Little Sur, but whichever side it’s on, if it’s not a burn out it’s too close to the line for comfort. On the bright side, there actually is a line this time. During the Basin Complex, eight years ago, lines were never completed (or apparently even planned) along the southern end of the Mt. 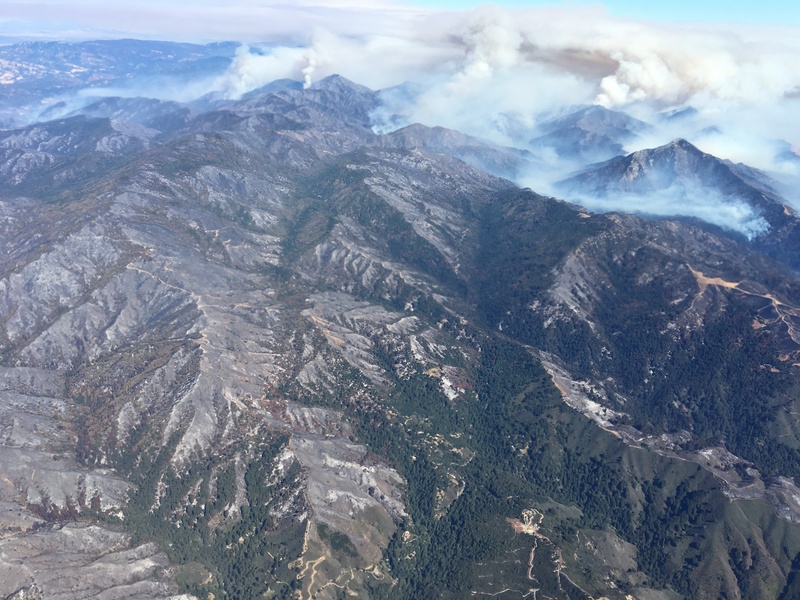 Manuel Ridge and through the gorge (in spite of ample time and resources) and the fire, for reasons which have never really been explained, was allowed to burn into the Big Sur Valley uncontested. The high elevation fire around Uncle Sam Mountain just keeps on burning. There were no new heat detections from the fire backing down toward the Carmel River. High humidity has likely slowed that fire to a crawl, but it will probably spring back to life as soon as burning conditions improve. This evening’s official numbers: 53,900 acres; 40% contained; 57 homes and 11 outbuildings burned; 3 homes and 2 outbuildings damaged. The fire was less active overnight, for a change. Most of the heat detections (the light red squares) are from a satellite pass around 11:00 pm last night. 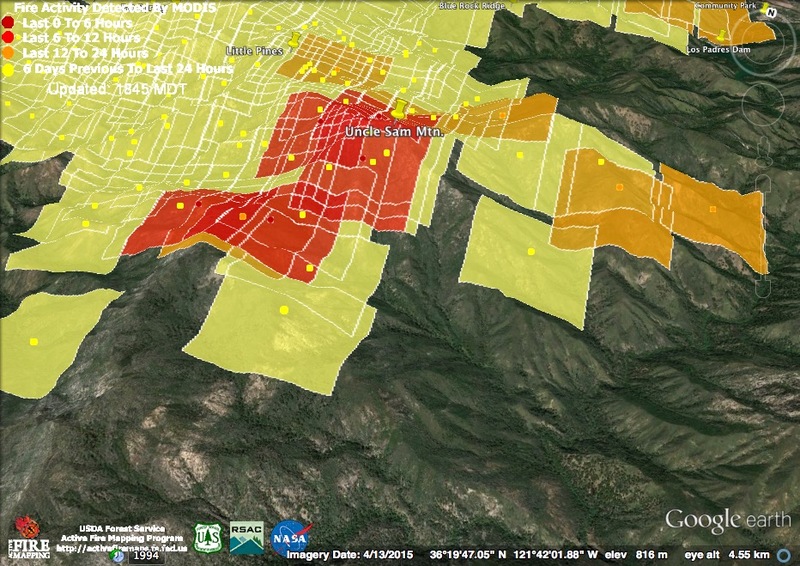 The 3:30 am pass (dark red squares) found heat only in the vicinity of Uncle Sam Mountain. Higher humidity than has yet been seen on this fire is expected over the next couple of days, which should slow things down a bit, even at the higher elevations. 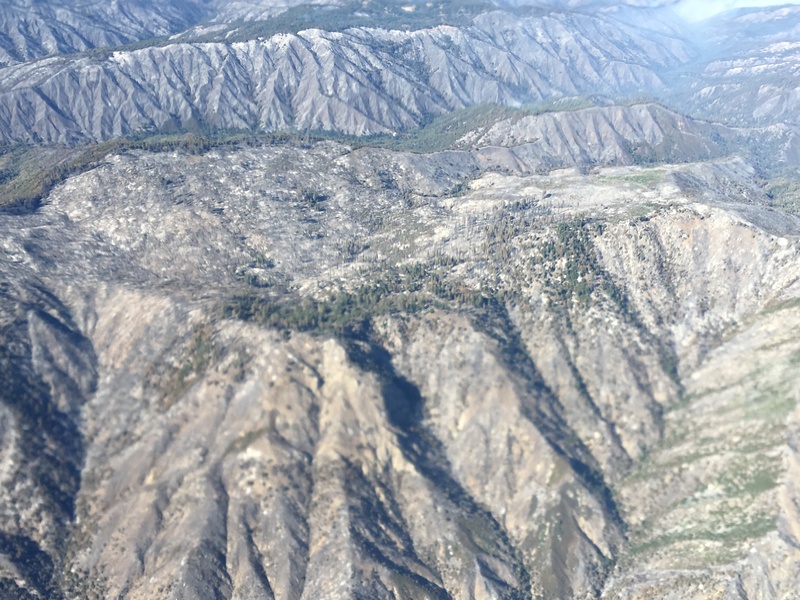 At the southwest end of the fire, the 11:30 satellite found fire actively backing down off Launtz Ridge toward the South Fork of the Little Sur River. 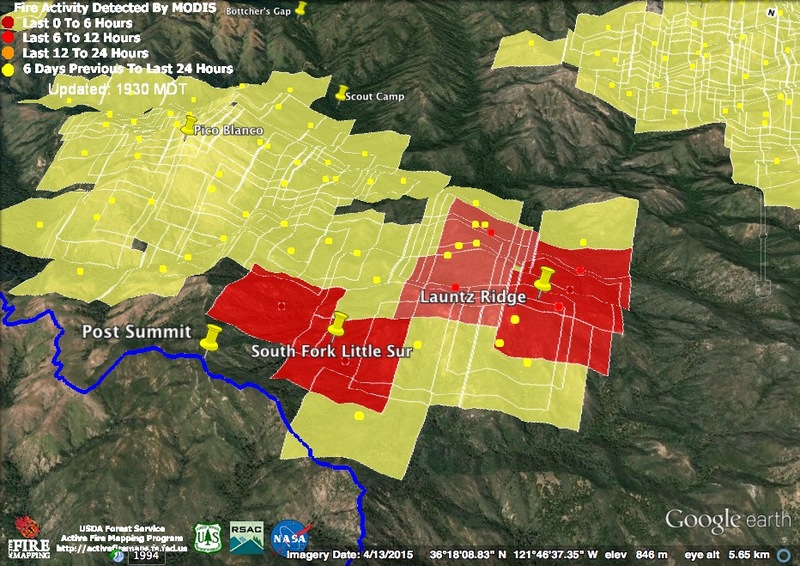 Last night’s infrared map (from 11:30 pm) places fire across the South Fork beneath Post Summit. If this is accurate, the fire is now in position to make an uphill run toward the Post Summit control lines. If conditions allow, burn out operations will probably begin near Post Summit soon. This morning’s assignments for Division P include “Plan and implement firing operations to Division P/O break.” As the Division P/O break is down the ridge a little to the west of Post Summit (Post Summit is in Division O), this indicates a plan to begin firing from the line on the East Molera Ridge, but not to fire all the way to Post Summit yet. If the fire begins climbing toward Post Summit, firing operations in Division O will probably have to begin sooner than planned. 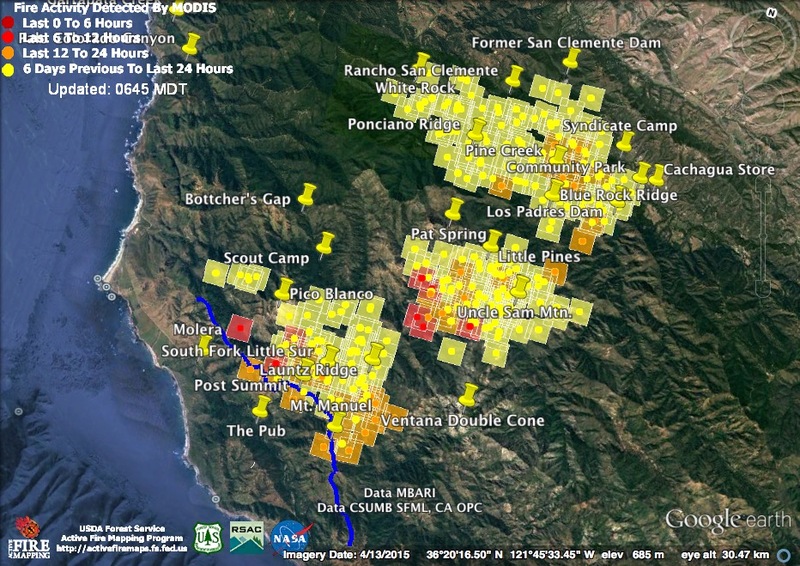 Renewed heat was also detected on Dani Ridge and along the North Fork Little Sur in the vicinity of Jackson Camp. 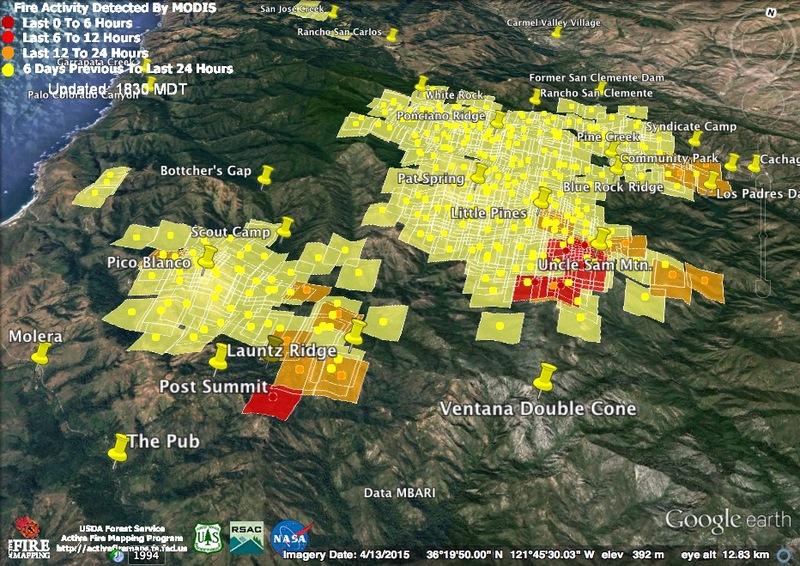 The southward progress of the fire toward the Ventana Double Cone appears to have slowed overnight, but the 3:30 am satellite found considerable heat on the mountainside above Sulphur Springs, on the Carmel River, as well as on the north face of Uncle Sam Mountain. 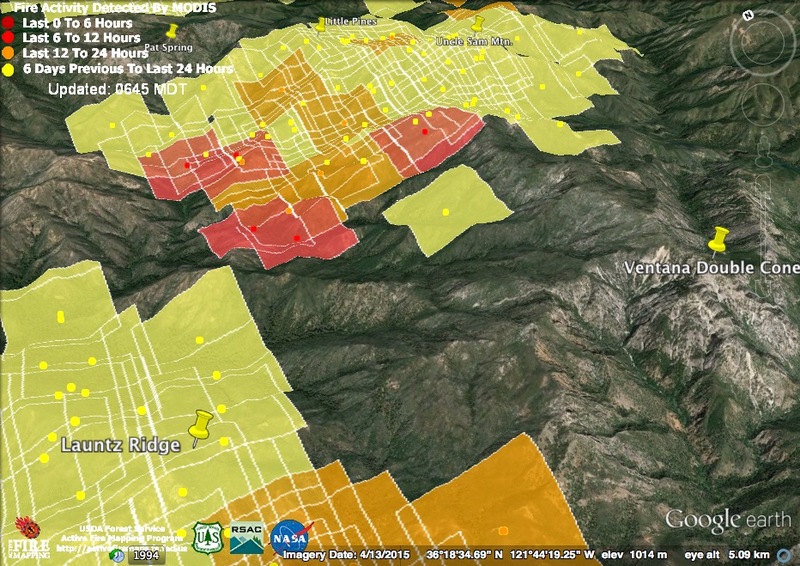 If the fire crosses the Carmel River near Sulphur Springs, it could run quickly up into the high country around Miller Mountain and Pine Valley. What really commanded attention last night was the fire coming down off the end of Blue Rock Ridge and burning on the slopes above the Carmel River between the Los Padres Dam and the Cachagua Community Park. This fire has crossed the primary fire line, on top of the ridge, but there are secondary fire lines in place at the base of the slope. I don’t know whether they have been firing from those lines or simply letting the fire back down to them (the infrared map from 11:30 pm last night suggests they may have started firing from them). Good thing winds have been light and that a heavy marine layer (as shown on the infrared map) pushed into Cachagua last night. This morning’s official numbers: 53,690 acres; 35% contained; 57 homes and 11 outbuildings burned; 3 homes and 2 outbuildings damaged. 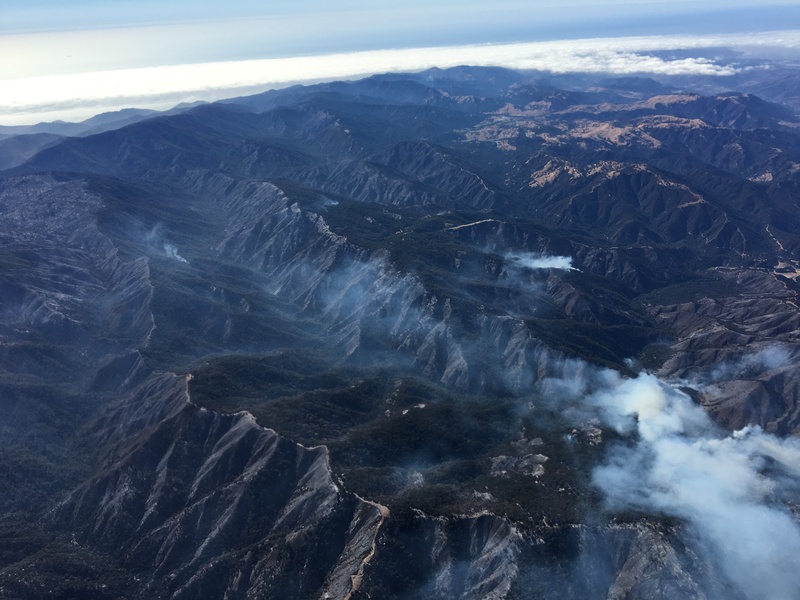 For earlier posts on the Soberanes Fire, see Soberanes Fire: Week One and Soberanes Fire: Week Two. This entry was posted on Friday, August 5th, 2016 at 8:02 am and is filed under Big Sur, Fire, Flood & Apocalypse, Santa Lucias. You can follow any responses to this entry through the RSS 2.0 feed. You can leave a response, or trackback from your own site. Appreciate your site for the clarity it offers and for being close to real time events. I noticed on another map that the fire crossed the Blue Rock dozer line and here you are, addressing it. Thanks. My property is at the end of blue rock ridge and I know there were back fires behind and around us last night. Chamber of commerce blog says a small slop over last night triggered evac. No hiway closure yet. So residents are under mandatory evacuation, but tourists are not? I guess so. We’ll be driving up there to see things later on and will report. Down here in Cambria we are keenly aware of fire threats and I’m telling people to,stay off highway one in your area even if open. I appreciate your site and xasauan blog with the infra red mapping and of course big sur katesblog. Good current reliable,information is so essential. Thank you for your thoughtful and extensive information gathering and sharing!! It has been very, very helpful in knowing what’s happening, especially your comments on the maps and mapping! Keith nice work on the events of 8-7-2016. For all the good things that have been accomplished yesterday turns out to be a head scratcher. Hopefully just an anomaly and will be corrected as things move forward. Thank you for your forth right account of Saturday night and Sunday. Living on the edge of a dying forest that continues on up to the national forest I’m constantly preparing my defensible space and thinking about my evacuation plan if necessary. I already had my own small fire caused by someone tossing a roach onto dried grass and the fire spread to my fence and up into pine trees all in five minutes. Whether to leave or stay is something I will weigh carefully if the time comes. Right now my decision is once the animals are out and safe I stay. Thank you Keith for the excellent recap, so nicely stated as, “a bizarre day.” Through most of the night I did watch flames on the top of Mt. Manual just above the Gorge. It would be really nice to know if it was a back burn or the main fire pushing that line. Maps are often clearer when the visibility of the collection of stale “footprints” is turned off. This can be accomplished by drilling down in the MODIS or VIIRS kmz and unchecking the older footprints. has better resolution (375 m), but often skips updates for unexplained reasons. The IR kmz maps are improved by changing the “spot” heat source icon size for legibility. In absence of MODIS (still), it would be interesting to hear commentary using this data source. Barbara – by now I’m sure you’ve realized, the only back burns I’ve seen evidence of are from Post Summit west. Main body of the fire is Post Summit and east, including Manuel. Thanks for your excellent description of ongoing fire activity from the air. The place names you use are familiar and helpful to many of us who have hiked throughout the region. Thank you. My brother is off Sycamore Canyon, on Middle Rd, staying fight it. He’s not on line. Your posts helping me inform hm and his family cope.